I have been meaning to make whoopie pies for years or that’s what it feels like anyway…I think I purchased this whoopee pie bookabout a year a go, its written by the the owner of the violet bakery in broadway market (I can’t believe I haven’t visited it considering I don’t live very far from it and that the lovely Spitafileds just down the road is a fairly regular jaunt. Anyhow following purchase of the book I then ordered a whoopee pie tin from Lakeland when I was ordering other more necessary stuff ( it was cheap and I needed to get to the total that you have to get to to get free delivery, well that’s my excuse at least and I’m sticking to it! ).So finally a year later I got around to using it…turns out a sheet of parchment paper on a baking tray actually works better than the tin for making flat round discs …but hey you live and learn….. 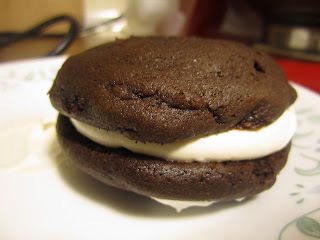 There were loads that I wanted to try, now that my peanut butter addiction is out in the open , I can say obviously peanut butter whoopies with peanut butter cream in the middle looked tempting as did the carrot cake whoopie with orange-mascarpone cream. 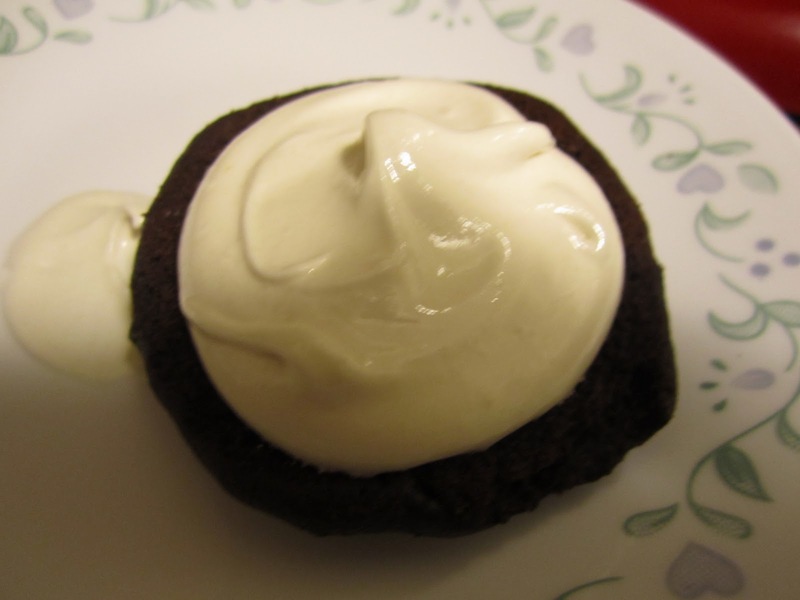 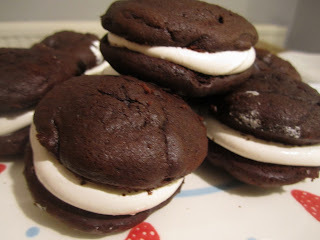 However I have been wanting to make homemade marshmallow fluff for a while (the hummingbird book uses it for quite a lot of their fillings in their whoopee pies ), so I went with the chocolate whoopee pies with marshamallow fluff filling. 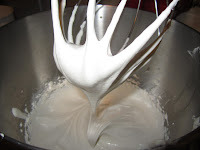 (Also I always seem to have batches of three frozen egg whites in the freezer left over from the frequent bread and butter pudding making that goes on around these parts when winter hits). 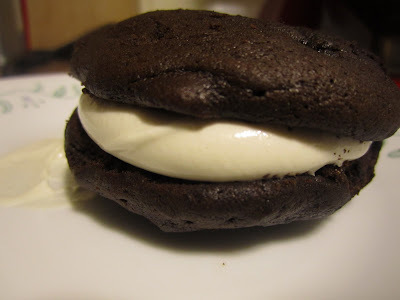 The first batch I made were too thick so I used less batter in the next round which worked better. It’s actually quite easy to use a tablespoon to spread a circle on the baking tray. 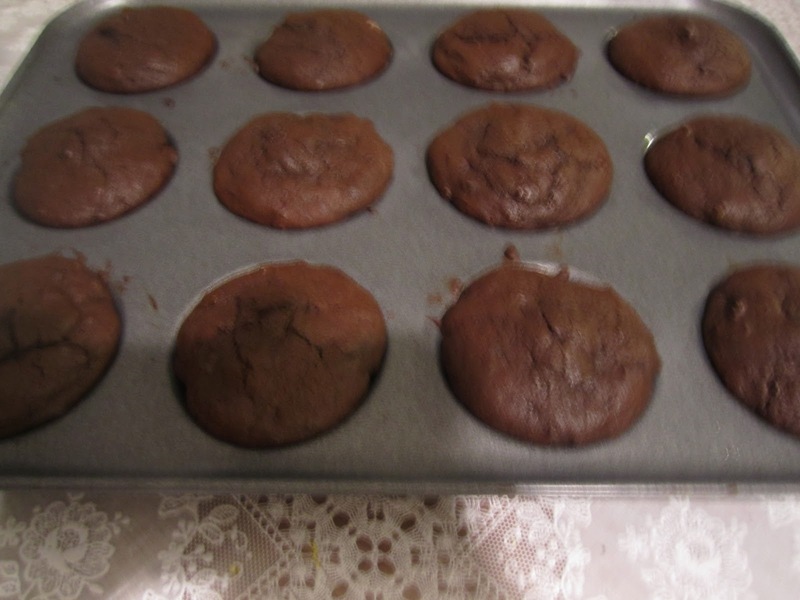 In a bowl sift together flour, cocoa powder,bicarb,baking powder. Drop onto trays with a tablespoon about 5 cm apart. 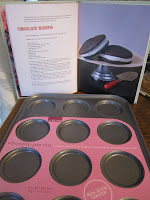 Bake for 8-10 mins for small pies or 10-12 for large (don’t overbake). Remove from oven and cool completely.